REALESTS NCAA College Michigan Football Basketball Rich Rodriguez Lil Wayne DMX: TURTLE? ... REALLY? 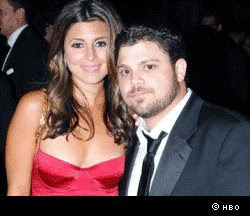 Reason 367,783,632,354 celebrities have better lives than us: Even in real life, Jamie-Lynn Sigler jerks off Turtle. We'd resigned ourselves to the fact that, like his character on "Entourage", Jerry Ferrara regularly outkicked his coverage in real life with Adrian Grenier's sloppy seconds, but this is just ... mind blowing. For her to pick Turtle over any douche bag in southern California - we don't know whether to applaud or cry. JESSE VENTURA, AL FRANKEN? WHO'S NEXT?